After reading Nicole’s blog and then hopping over here, I decided to also take the “Yes” Mom Challenge. Daily I tell my kids no they can’t do something because I don’t want to deal with the mess or the clean up or because it is just easier to do myself. I am going to try to let my kids do more fun, messy things that they ask to do. I actually already had an opportunity to say “yes” to my kids today. Lucy asked to wash the dishes today. I realize that I should look at this as a great time to teach her some responsibility, but normally I would tell her “not right now” because it is less messy and goes much more quickly if I do it myself (our dishwasher is broken, by the way – has been for about 2 months). Today, I decided to let her help and she had a great time and she worked really hard. Norah also asked to help with something so I let her snap the green beans for dinner. She, too, worked really hard and I only have to do 1/2 the bag! There are green bean ends all over the counter and floor, but who cares!! As Nicole and Jill Savage stated, this is not about permissive parenting. Our kids obviously need boundaries, but it is about saying yes when we are only saying no for selfish reasons!! First – check out Heather’s blog. She watched my girls today and posted some cute pictures of the kids. She took some great ones of Daphne!! Second – so my photo blog has become my “once in a blue moon photo blog”, but check it out. Tooth number 2 is finally in!! I feel like we have had a MILLION things going on over the last couple of weeks. Norah and Lucy started swim lessons last week. While the first day or two didn’t go so well with Lucy – they are both doing great now and loving it. I think I am going to sign them up for another session in a few weeks. Max came into town this week. He had a booth for Foreign Language Friends at the St. Charles Homeschool Convention. Kevin stayed home on Tuesday and we had our babysitters come over on Wednesday so I could help Max at the convention both days. My training for the triathlon is going well for the most part. I haven’t been swimming as often as I like, but the running and biking on right on target. Some friends of ours found me a triathlon bike to use – it is amazing how different it feels from my mountain bike. Last week on my mountain bike, I rode 6 miles in about 40 minutes. On Saturday, I rode 7 1/2 miles in about 40 minutes – not bad. Although I think I have a heavy head because my neck was so sore by the time I finished riding. Maybe my helmet is too heavy and since I am leaning really far forward – it just feels strange! I have been consistently running 3 miles – so I am ready for that leg of the race. I just need to make for of an effort to swim. Now that Daphne is rolling both ways – she is all over the place. I lay her on a blanket – which is really pointless because she won’t stay on it. She is my earliest mover – for sure. Even though Norah could roll over, she didn’t very often and Lucy rolled over later than Norah. I will try to post pictures soon! Check this Lipstick Profile out! I know it is hard to see on the computer, but she has her first ponytail on top of her head!!! Oh my goodness – how can Daphne be 5 months already? It is hard to believe, but we are enjoying every minute with her. 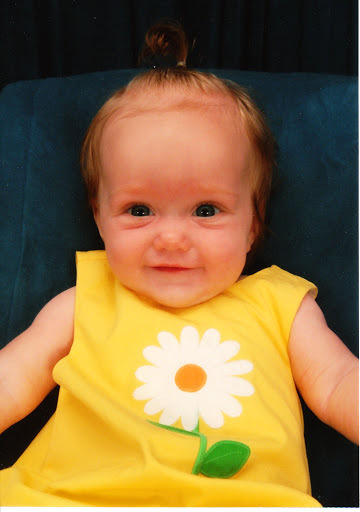 She is a happy, easy-going baby – as long as she gets her sleep (she has some true Leitch blood). She does get a little bored when her sisters are not available to entertain her – which doesn’t happen often. It seems like someone is always hovering over Daphne providing her with nonstop entertainment! Now that the rolling over things is old news, Daphne just sleeps however. Sometimes she sleeps on her tummy, sometimes her back and sometimes her side. When she first wakes up from a nap or nighttime sleep, Daphne never really cries. She just coos and kicks her mobile. Most mornings we hear the mobile being kicked before she even makes any noises. Just noticed – One of Daphne’s bottom front teeth is finally in!! The second one is close! I’m not great at surprises – in fact, I pretty much NEVER plan them because I usually spill the beans or mess something up. This year Heather and I decided to plan a surprise camping trip for our husbands. Kevin and Ryan had been talking about going this summer and the kids were asking too. I knew if we could pull it off, Kevin would be really surprised, because I don’t camp often. Heather and I decided on a weekend and a park. Norah and Savannah made books about camping for their dads. The last page said, “Surprise! We are going camping tomorrow!” Heather scanned in Savannah’s book and posted it here . We had dinner on Wednesday night and the girls gave Kevin and Ryan their books. The kids really did great! They were awake later than anticipated on Saturday night (that would be thanks to Lucy who was WIRED), but all in all they slept great. Daphne had a hard time falling asleep at night and didn’t nap as much as she would have at home, but once she fell asleep at night – she slept all night! Because of the lack of naps, Daphne cried more than normal. Kevin actually thought she did fine. We really didn’t do a lot while we were camping. No hikes this year – I forgot the Baby Bjorn. The kids went swimming in a little water hole – totally grossed me out, but Kevin thought it was fine (I did make them take showers immediately following and again at bedtime! Ha!). The kids rode scooters around and basically just played together the whole weekend. There was a nice playground right in the middle of the campsites – perfect for us. The kids got along great – it amazes me that they pretty much never have any squabbles.The weather was INCREDIBLE and the park was very nice. We had great food and fun with the Morrisons! The only issue we had (well, besides Lucy keeping her sisters awake on Saturday evening) was Norah waking up wheezing and coughing in the middle of the night on Saturday. Totally freaked us out. She hasn’t needed any breathing treatments in almost a year, so totally forgot to even take the nebulizer. The more she coughed, the more she cried and the more she cried, the more she coughed. Nice. We were able to get her calmed down and got her to drink some water and she finally went back to sleep. Kevin and I didn’t sleep very well because we kept checking on Norah. We decided we needed to head out as soon as we could pack up so she could get home and start her breathing treatments. We were home by lunchtime and the girls rested in the afternoon. I think by now they have completely recovered from a lack of sleep and Norah is talking about the next camping trip (which Daphne and I may skip out on).